Pythium damping off causes stand loss and yield reduction in North Dakota. The disease is particularly damaging in cool and wet soils. The pathogens involved, biology, identification and management are discussed. Damping-off, the rotting and death of seeds and seedlings, can be a devastating disease and is of great economic importance to soybean production. Damping-off (Figure 1) mainly affects soybean plants prior to seed germination and throughout the seedling stage. Any field with damping-off may experience a significant stand reduction. Yield losses of up to 30 percent have been recorded in other states. As acreage of soybeans in North Dakota continues to increase, so do economically damaging diseases such as damping-off. Pythiums are a group of fungal-like organisms (Oomycetes) that are closely related to the Phytophthora pathogen. 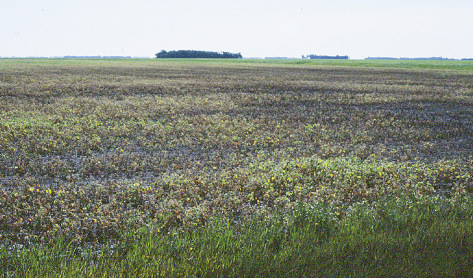 Multiple species of Pythium are found in association with soybean roots in North Dakota. The majority of them cause pre- or postemergence damping-off. In response to increased damage from damping-off, the North Dakota Agricultural Experiment Station conducted research to identify Pythium species causing damping-off. 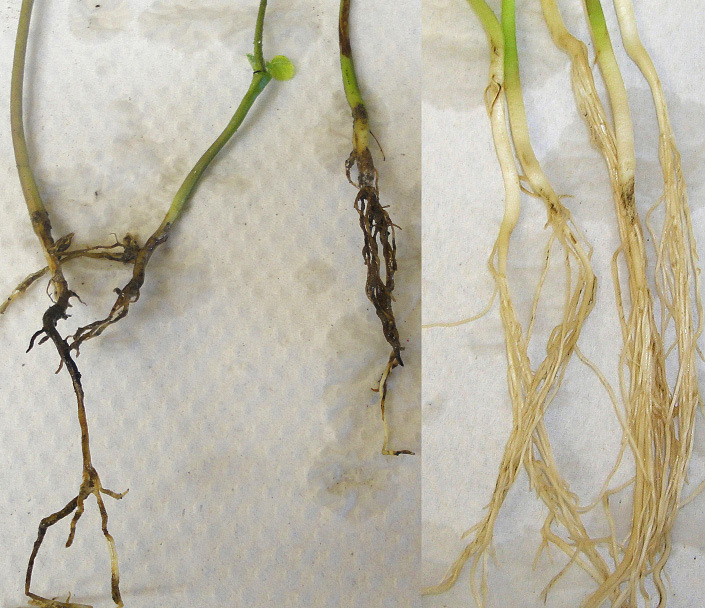 At least 27 species of Pythium were found in soybean roots, but seven species were predominant. They are: P. ultimum, P. heterothallicum, P. irregulare, P. attrantheridium, P. sylvaticum, P. perplexum and one unidentified species. The identity of the Pythium species causing disease is important due to recent studies showing that not all species are controlled by the same fungicide seed treatments. Pre- and postemergence damping-off are usually the first symptoms of infection by Pythium observed in the field. 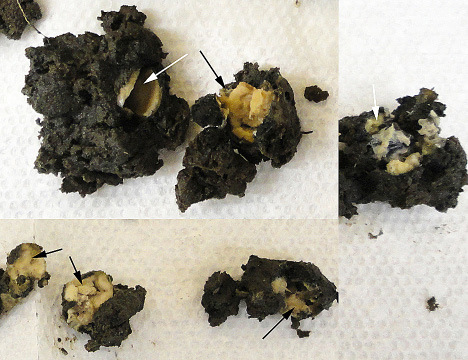 Symptoms of pre-emergence damping-off include seeds failing to germinate and/or the total disintegration of the seed (Figure 2) while in the soil. Post-emergence damping-off is visible first as lesions and discoloration on the roots (Figure 3). Once infected, the roots will begin to disintegrate and rot. The rotting root system eventually will lead to the collapse of the seedling. Young plants are most susceptible to postemergence damping-off, while adult plants are not readily infected due to the thickness and lignification of the root tissue. Other pathogens such as the Oomycete Phytophthora sojae and the fungi Fusarium and Rhizoctonia also can cause damping-off under certain conditions. Determining the exact cause of damping-off can be difficult because plants can be destroyed quickly, leaving little evidence of the causal agent. Pythium species can survive for up to 10 years in soil as sexual, thick-walled oospores. When soils are saturated, oospores can germinate and produce swimming spores called zoospores. Disease develops when spores infect the soybean root and the pathogen mycelium (mold-like structure) spreads inside the plant. New zoospores can be produced in infected roots, spread in water to other plants and cause secondary infection. Spores can travel great distances in overland flooding, potentially introducing high levels of inoculum and new species to flooded fields. High soil moisture usually is associated with high levels of damping-off by Pythium. During dry periods at planting and the seedling stage, damping-off by Pythium is rare. Fungicide seed treatment – Seed treatments are a useful management tool for Pythium and are most effective when the soybean is most vulnerable to infection (at seed germination). Fungicide seed treatment research is ongoing; products available and efficacy data are changing continually. Consult the “North Dakota Field Crop Fungicide Guide” (PP622) for products labeled and recommended for Oomycetes (Pythium and Phytophthora). Maintain good drainage – Managing areas that are prone to flooding will limit infection and the spread of Pythium. Managing flooding by tile drainage or ditching may be beneficial. Resistance – No resistant varieties of soybean exist. However, cultivars may differ in their susceptibility to damping-off. Crop rotation – Pythium species have a very wide host range and are long-lived in soil; therefore, the effectiveness of crop rotation for managing Pythium damping-off is limited.